where there's a lock, there's an opportunity. Tarek picks the lock. As the bolt clears the frame, the door explodes in a shower of splinters, chunks, and hardware. Reflex saves for all on the stairs. Then roll initiative. Ian winces at the blast, "Ouch, that's gonna leave a mark. Ya'll ok up there?" 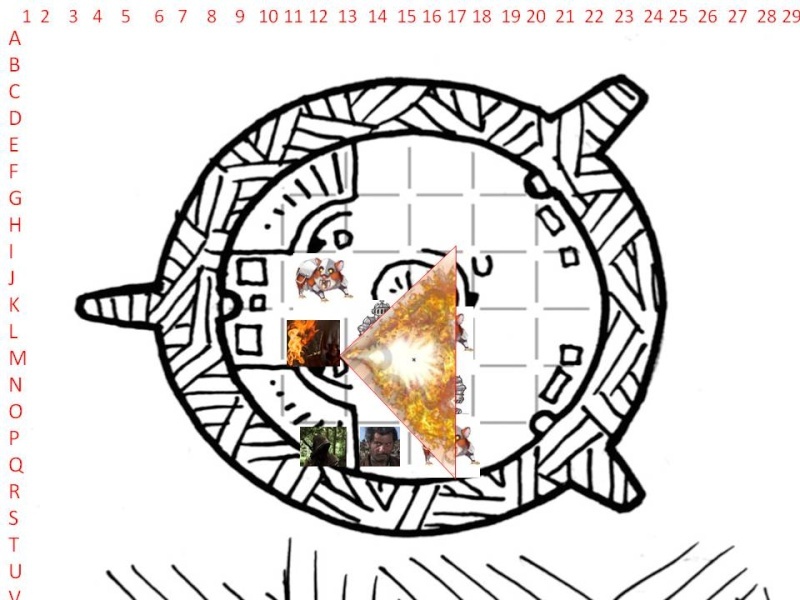 Tarek ducks under the blast just in time but a doorknob and a hing hit Teodras square in the jaw for 5 damage. Behind the door, 2 more of those armor things wait with what can only be described as 3 mangey dire hamsters! A grisly looking old goblin runs behind them, disappearing up anotger stairwell. Need initiative for Theodras again. we'll need a map too before I can take Tarek's action. Maps updated. 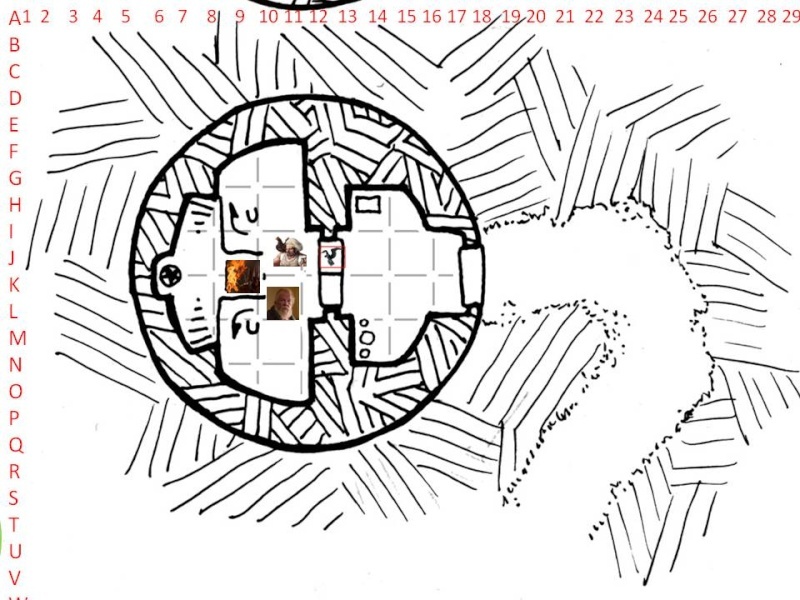 I think I am going to have to post both maps until we all get on the same floor. Theres 1 open door at p13. (The stairs ascend away from center). So tarek and then theodras. Theodras CAN run up the other stair, but that door is not opened. Tarek is going to hold his action for the big armored guys to hopefully charge. navyik wrote: Theres 1 open door at p13. (The stairs ascend away from center). So tarek and then theodras. Theodras CAN run up the other stair, but that door is not opened. ack, I had that backwards, sorry. whit10 wrote: Tarek is going to hold his action for the big armored guys to hopefully charge. so... you're just going to sit in the bottle neck and clog it up? Ian hears the commotion above and looks at the stairs wearily thinking to himself, "I thought dungeons were supposed to go down... so much less effort than always climbing up." He eyes the tactical position of his new friends and calls out, "Why don't you bring them back down to us?" Ian hopes his plan saves a hard charge up the stairs, in armor... he would surely need a nap after that! Stepping forward where Tarek was just standing, and peeking into the room with bow and arrow drawn. The hamster Tarek attacked howls in pain, and snarls viciously at Tarek. Its red eyes glare with a nearly sentient hatred. I still need initiative for Theodras. I know I've let the thread lag too long, so I'll just go with this. Theodras shoots a second hamster, which slumps and begins to stagger away squealing. Sorry, I thought you said I was after Tarek. MrBrownstone75 wrote: Sorry, I thought you said I was after Tarek. Its all good bruh. I'm going to keep you going after Tarek for now. I'm overdoing it with initiative checks. ReR hangs back safely out of the fray. He raises his torch in front of his face, and shouts "BURN IN THE FIRES OF TRUTH!" into the flames - which blast out the other side in an arc of fiery doom! 15 ft cone from that position should catch most of them. Lumenor's action deserves a map update to clarify possible position and concentration issues. I dont think we're in sync here. The door from the stairs is in tareks square. 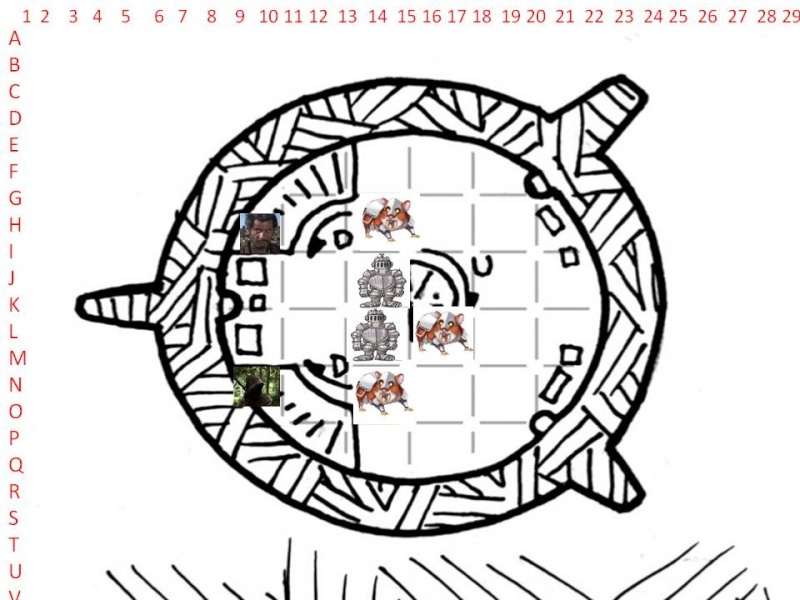 Lumenor has to go past hamsters and armored goblins to get there. He has 6 squares of movement to do so from the bottom of the steps. Ah, I see. I thought the steps/door entered the room at M/10. Lumenor would have then come up the other steps, and fired from vicinity J19 if he can get that far. Lumenor gets to the top of the opposite stair and finds the doior locked at F-13. He still has a standard action. 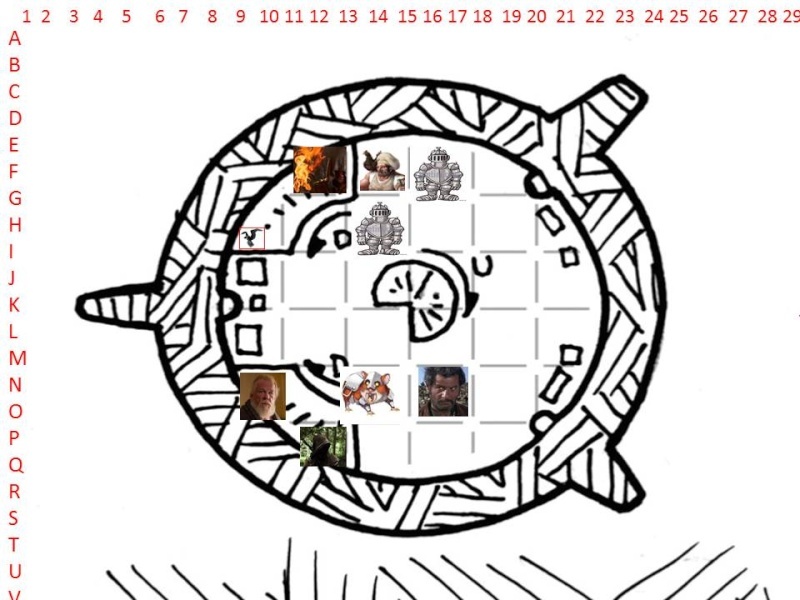 The crippled hamster Theodras skewered hobbles up the spiral stair at center. The other 2 hamsters launch at Tarek. Tarek is bitten by rapidly flaying jaws for 4 damage. Tarek make a reflex save. navyik wrote: I dont think we're in sync here. The door from the stairs is in tareks square. Lumenor has to go past hamsters and armored goblins to get there. He has 6 squares of movement to do so from the bottom of the steps. and you couldn't have said this before you asked for a map update? The H.O.U.S. acted, so Chef is up? Map is a bit hard to read if Chef can reach the top of the stairs and engage any foes. He will follow behind Lumenor. Does his movement allow him to engage any foes and attack in melee? Or perhaps to have a clear shot with his throwing knives/axes? Robyo wrote: Map is a bit hard to read if Chef can reach the top of the stairs and engage any foes. He will follow behind Lumenor. Does his movement allow him to engage any foes and attack in melee? Or perhaps to have a clear shot with his throwing knives/axes? at least the way it looks to me, there are 3 squares on the 1st floor with the final square being a partial square on both maps. I would guess 3 squares moves you from the 1st floor to the 2nd or O-10 on the 2nd map. There appears to be 1 more empty square next to Theo, but then you run out of unoccupied squares, unless you try another overrun. 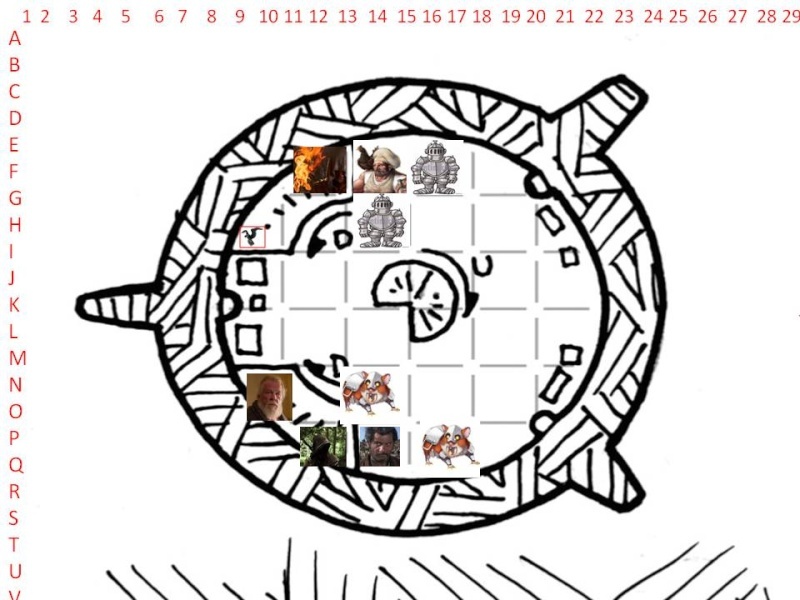 Do the goblins and their giant pets have any reason to come down to us? Seems like we're doing the kick-in-the-door murder hobo thing in this tower, so I guess we're going up and exterminate. Chef will Hustle up behind Lumenor, move thru his square and into the room, taking cover behind the spiral staircase in the center of the room, H-16 or so. If that's a legal room, I'm done. Robyo wrote: Do the goblins and their giant pets have any reason to come down to us? Seems like we're doing the kick-in-the-door murder hobo thing in this tower, so I guess we're going up and exterminate. The door in front of Lumenor is locked. I tried to enter that way and was topped there. Oookay then. Chef will try to break open the door. Robyo wrote: Oookay then. Chef will try to break open the door. Is that what you say when you attack your cologne too, "take that, evil Dior"
Nice one! But Chef isn't classy enough for cologne. When he applies his home-made garlic-based deodorant concoction, he might say "take that, evil odor!" Or as the french say "odeur"
Lumenor still has a standard action. Would he like to "aid another" on Chef's check? navyik wrote: Lumenor still has a standard action. Would he like to "aid another" on Chef's check? Lets assume he does: Chef charges the door where Lumenor lends a swift kick. Chef bowls into the doorway like a meat-encrusted tenderizer! 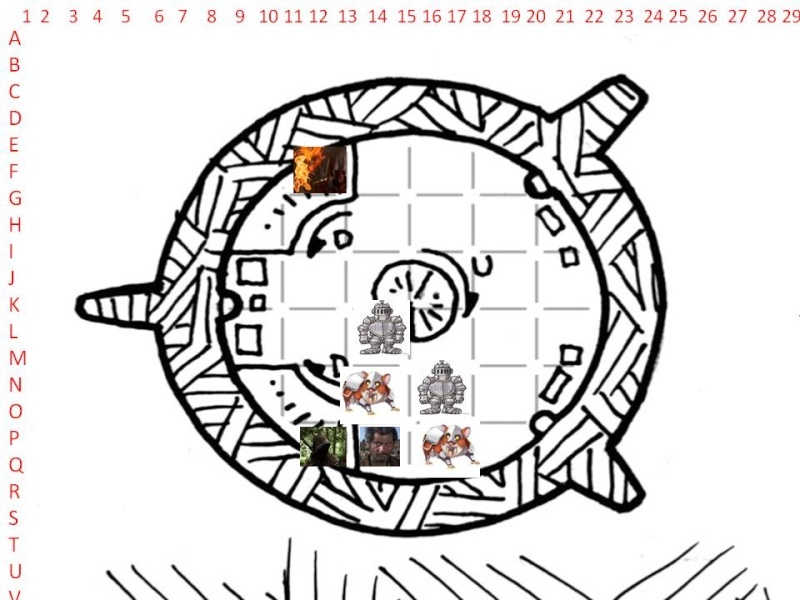 The armored Goblins turn and charge Chef, both missing. Ian mvoes 20ft, banging his greatsword against his metal armor as he stomps loudly up the stairs. Ian attempts to imitate a Krayyt Dragon's roar, "urrrhhggaaahhhh!" to scare the nearest Hamster. You guys are killing me. I check in every day for 3 or 4 days and nothing has happened...and then I come back in a few days and somehow everyone has been waiting on me, lol! "hey, keep moving up there"
ok, I'm utterly confused by this map then. Step forward 5' and put the hamster down, hopefully. what is going on in the northern section of the map? Are they in the same room? Sorry for the delay everyone. Had a long day of work and travel yesterday. Theodras takes a move action to unsheath his longsword (longbow still in his other hand). He takes a vicious swipe at the giant hamster's head.